Hometown Heroes is not a book about war. It's a book about people and how their lives were touched by Desert Storm. 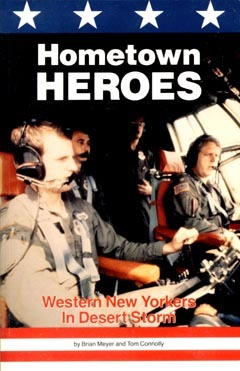 Thousands of Western New Yorkers played many roles in Desert Storm. Their sagas are woven together in a lively text that affords a unique glimpse of the war effort. Authors Brian Meyer and Tom Connolly interviewed more than one hundred people, from Buffalo-area soldiers who lived in the scorching sands of Saudi Arabia, to peace activists who promoted dialogue back home. This is a story about how local residents responded to an event of historical proportions.